Jokes and ironies aside, for GESAB, 2012 has been an exciting year, due to its final consolidation in Mexico and the sustained growth of the IT line, in which the company has put a lot of effort and many hours of R + D + I. Solutions for energy saving and efficiency in datacenters like the hot and cold corridor enclosure, CCNOC, or direct free cooling system patented by GESAB, Ecooling, have earned the confidence of important companies such as Banc Sabadell, BBVA, Securitas, Technical Systems State Lottery (STL), Mutua Madrileña and Desigual. 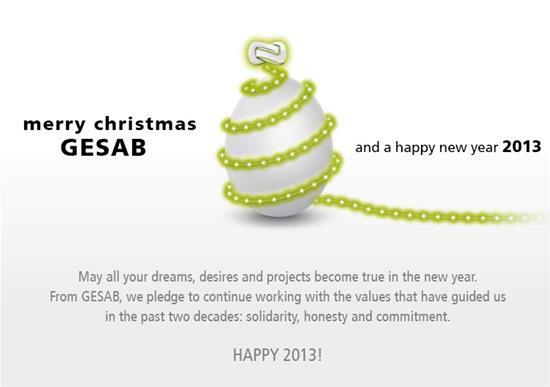 GESAB team wishes all our clients and integrators a Merry Christmas. Here you can see the interactive e-card we designed.